Hey-up All, I thought it would be a bit of fun to have a go at the Guest DT call running for High Hopes Rubber Stamps at the moment. You still have time if you are interested in applying as the deadline is the 22nd February. So do frogs say Ribbit or Gribbit? Definitely Ribbit! Lovely image, and gorgeous colouring. Oh my this is ever cute!! I love your coloring…and what a creative way to use those letters!! Best of luck on the DT call!! Oh this is just so cute dear!!!!!! Great card. Your coloring is perfect. oh your card is very fabulous I love your stamp and colour !!! 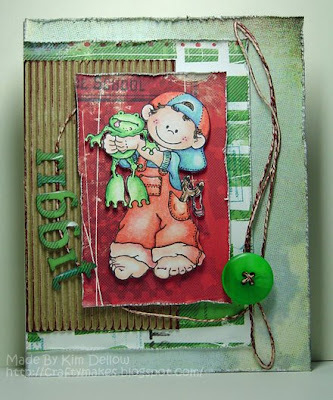 Fantastic card Kim, love the colours and textures, and definately ‘Ribbit’…lol. Good luck with the GDT Kim! Your card is adorable! Love that image! Gosh, is he ever cute!!! 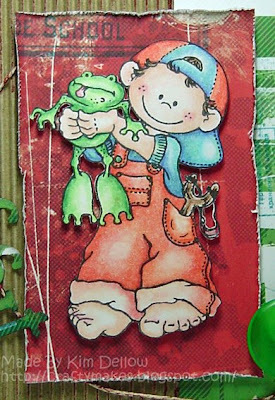 I have a little frog boy that I’m posting tomorrow, but it’s not the same as this one! 🙂 Sadly, I don’t own of these stamps!! You’re making me change my mind!! LOL! This is so great. Love it. I love all your cards.